Having established himself on some of the biggest labels of the day, no-one’s favourite curly haired DJ Jacky squanders any further opportunities by stepping out with his own new label. After many hours consultation and some key focus group meetings, he’s decided to call it, um…Jacky & Friends. All that’s left is to find some actual friends who are crazy enough to release with him and you can be assured the label will become a reliable outlet for some high grade dance floor weaponry. In all seriousness, Jacky & Friends is an already well known party brand that has left a trail of madness and ever increasing fan bases from Manchester to Ibiza, Newcastle to Croatia. Couple that with Jacky’s own electrifying sets and tunes on VIVA, DFTD, Elrow Music and many others, and it makes sense to now step out with a brand new label. At this point, then, you will be expecting a tedious run down of the music, but instead of that Jacky wants to let the music do the talking. The first EP features four big tracks made up of two originals from the man himself, plus some massive remixes from hot house talents Huxley and Kreature that take house music in big and bold new directions. 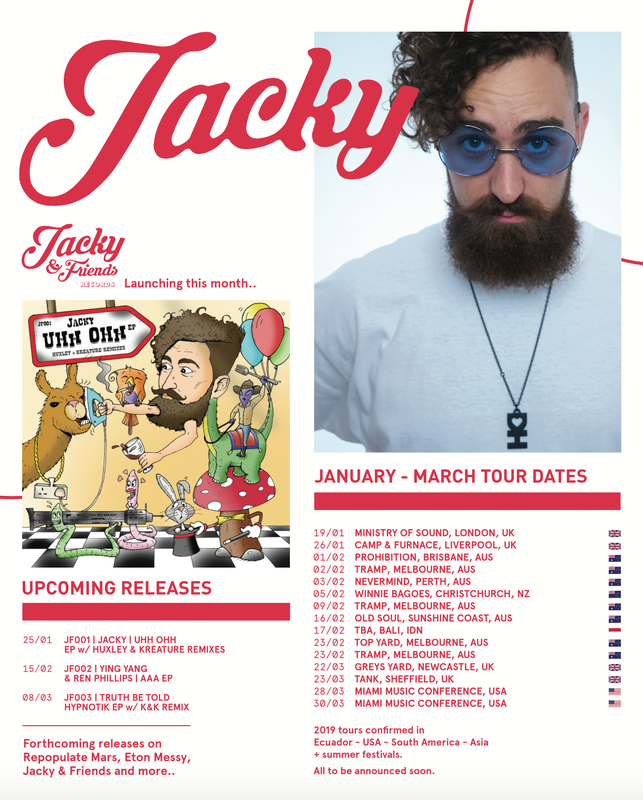 This February Jacky will also be embarking on a 9 date Australia and New Zealand Tour and playing many of the best cities in both countries. Please see the full gig lists below.